Here at Generations at Rock Island we support the fight against Alzheimer’s and dementia. Every year we assemble a team and get to work on brainstorming ideas about fundraising efforts to make our participation in the Walk to End Alzheimer’s a success! 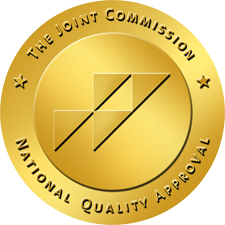 We are one of three facilities in the Generations Healthcare Network that has an Alzheimer and dementia ward that offers residents care for these illnesses and helps individuals to maintain optimal level of independence and quality of life in a secured and safe environment. 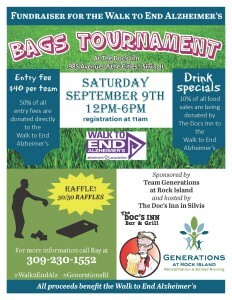 Our fundraising event this year is a bags tournament hosted by The Doc’s Inn in Silvis on September 9th from 12pm-6pm. There will be drink specials, raffles, 50/50 raffles, and the best part- 10% of all food sales and 50% of all entry fees are being donated by The Docs Inn to the Walk to End Alzheimer’s. Follow our hashtag #GenerationsRI for highlights from our events and also follow #Walk2EndAlz – the official hashtag of the Alzheimer’s Association. Then join us on The Walk to End Alzheimer’s on Sept 16th. We have a vendor table and are the exclusive sponsor of the photo station- a new and exciting attraction this year! Watch our Facebook and Twitter pages for more information, photos and recaps of an exciting month ahead.